"Chapter Two: Blowed Up Real Good!" 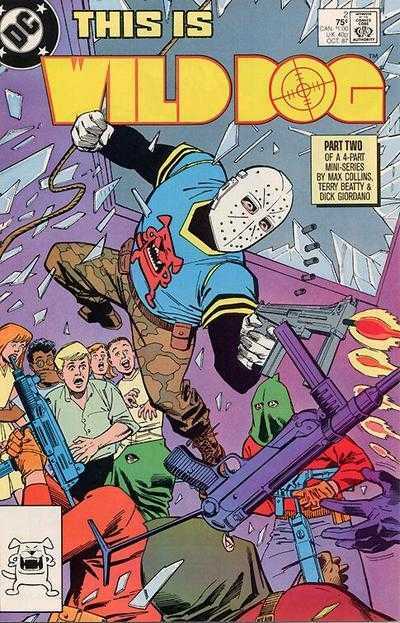 After an (unplanned) extended break from our favorite hockey-masked vigilante, let's return to the Wild Dog miniseries. If you need to catch up, you can find our discussion of the first issue here. We open during the morning newscast at Eyewitness 7 News. Reporter, Susan King is recounting her recent abduction and subsequent rescue at the hands of the Quad Cities newest masked vigilante, Wild Dog. They show an interview she conducted with Police Chief Davis, who appears to believe our Dog is not a hero, but a menace (I swear I've heard that somewhere before...). Following the telecast, Ms. King is called into the News Director's office for a chat. He offers her a featurette on Wild Dog, which would include speaking with local law enforcement and conducting man-on-the-street style interviews for reactions. King, however, has other ideas in mind... she wants to dig deeper and actually uncover Wild Dog's true identity. We shift scenes to the home of Lou Godder... one of the prospective Wild Dogs who we met last issue. He's reading the morning paper which features a Wild Dog-centric cover story. His daughter, Stephanie has been chosen to attend the Honor Students' Congress that day at Mark Twain Junior High School. We also learn that Lou's wife is no longer in the picture, it is alluded that she has passed. Next we visit a motel room wherein there had recently been a murder. A woman named Jill and a fella named Sydney appear to have been the co-conspirators, and the victim is one Professor Mensa. Their plan is for (the terminally ill) Sydney to attend the Honors Congress in the guise of Mensa. Susan King starts her expose by talking to another of our would be Wild Dogs, Lieutenant Andy Flint. She compares Wild Dog's actions with Flint's sentiments toward violent crime. Flint dismisses the notion and kicks the nosy newsies out of his office. He is then joined by our third Wild Dog candidate, Graham Gault. He brings with him a bit of intel regarding a terrorist group, The Committee for Social Change. Flint jokes that Gault may be Wild Dog. We follow Graham to the local mechanics garage, home base for our fourth and final maybe-Wild Dog, Jack Wheeler. They share a bit of innocuous small talk before Gault leaves. As he exits we see Susan King watching from the parking lot. It is now time for the Honors' Congress. "Professor Mensa" is welcomed and warmly received by Principal Ernest Ernst, and is led to the stage set before the packed bleachers of Mark Twain Junior High's gym. He begins his speech by revealing that he is in fact not Professor Mensa. He opens his sports jacket to reveal his torso is wrapped in dynamite. The children and faculty begin to panic, however, our human bomb insists that he means them no actual harm. He promises that they will all be able to go home after his speech, and his designs are only in destroying the building... and himself. He is soon joined by several men wearing similar masks to the folks we met last chapter. We get a montage page featuring three of our would-be Wild Dogs reacting to the current hostage situation, and ultimately follow Lt. Flint as he enters the school. He presents himself in front of Sydney, and attempts to negotiate a hostage release. Syd ain't having none of it, and instructs his men to put him somewhere to be dealt with later. He then continues with his speech. His cause is about taking down the system and all institutions which support it. Outside, we get our first real-time glimpse of Wild Dog for this issue. He ether-rags a police guard and ascends to the roof of the gym. Inside, Sydney reveals that he was lying when he said the students would be free to go after the speech... instead, only half of them would survive this day. The other half would join him in martyrdom for his cause. Wild Dog cuts a round portion of glass from the gyms skylight and fires a tranquilizer dart at Syd. He then descends to the gym floor blasting crossbow bolts into (and through!) the faceless terrorists. There's a brief fire-fight, in which it appears that Wild Dog is killed. Lucky for the kids, he was packing his bulletproof vest today... though, sadly his laughing dog jersey is ruined. Wild Dog makes short work of the terrorist flunkies to the rousing applause and adulation of the child hostages. He scoops Sydney up and exits the gym. The local law enforcement parts like the red sea to allow him to pass with his bomb-strapped bounty. The Dog loads his captive into the back of his pickup truck and drives him through the cornfield. We rejoin our hero at a barn in the middle of nowhere. Sydney is strapped to a chair... and Wild Dog has informed the terrorist squad of their location. As the masked men enter, Wild Dog triggers the explosives from a safe distance razing the barn to cinder. I'm surprised at how much I'm enjoying this series. Wild Dog always been one of those knee-jerk mockable characters... something out of Wizard Magazine's "Mort of the Month" hit-pieces, however, I think this concept could have had legs for an ongoing series. It's silly and violent, yes... but it's a fun silly and violent. This issue continues to play with the idea that nobody... not even the reader knows who is behind the Wild Dog mask, and does so quite well. I have my sneaking suspicion of who is ultimately going to be revealed, however, I'm unsure if that's due to the story... or if I'd somehow unwittingly spoiled myself years back, and just have it in the back of my mind. The storytelling device of having reporter Susan King attempting to do an expose is a nice touch, as she gets to ask many of the questions the reader may also have. During this chapter, the Dog kind of turns the corner from violent menacing vigilante to bona fide hero. The junior high school students sing his praises, and the local law enforcement doesn't interfere with his heroic endeavor... He's gotten plenty of play on the local (?) television news, so he's likely a household name (at least in the Quad Cities). I'm still giving this one a ringing endorsement (as if that matters)... definitely track this one down, I'm sure it's in many'a cheap-o bin nationwide. It's a lot of fun... and the mysterious nature of the titular hero brings with it quite a bit of 80's-comics intrigue. Recently lucked into nearly a full run of this, looking forward to jumping in!